The CSCS Card is a UK construction worker’s card awarded by the Construction Skills Certification Scheme. The Card provides evidence of the qualifications you have in your trade: both Construction NVQs and CSCS Health, Safety & Environment Test passes. Your CSCS Card shows a current photograph of you on the front; your full name; and your registration number. It also has a CSCS hologram logo on it; a CSCS Smart Card Chip; and a title describing the type of CSCS Card you own. There are several types and colours of CSCS Smart Card. The back of your CSCS Card is endorsed with the qualification route you have taken to achieve your current role in the UK building industry. Your CSCS Card is fitted with a Smart Card chip. The chip contains up to date information about your Construction NVQ levels, your CSCS Test passes and your registration number. A prospective employer or site owner can call up your records using a CSCS Smart Card reader and check that your qualified levels of competence and Health and Safety training are suitable for the role you perform or are applying for. Why Do You Need a CSCS Card? The CSCS Card is the industry standard proof of Construction NVQ achievement and Health and Safety qualification. Most UK building sites operate a “No CSCS Card, No Work” policy. Without the correct CSCS Smart Card for your trade, and the level of competence you have reached in that trade, you will not be getting the roles that you deserve. Your CSCS Card acts as your passport to work in the British building industry. It will get you interviews for roles that are both more satisfying and more financially rewarding. You will find that large contract employers now demand that their workers can prove their competence and Health and Safety qualifications with a CSCS Card, as well as individual UK building sites. 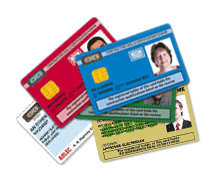 The CSCS Card is awarded in a number of colours and types. The colour of your CSCS Card denotes the Construction NVQ Level you have achieved. Different types of CSCS Card are suitable for different roles: in order to take up a managerial position, for example, you must possess a Black Manager’s CSCS Card. This Card is for a trainee construction worker who is enrolled in a Construction NVQ but has yet to qualify. This Card is for trainee supervisors, technicians and managers who are enrolled in a relevant qualification. This card is for Graduates who have achieved a degree recognised as relevant to construction. This Card is for supervisory and managerial workers who have not yet achieved their Construction NVQ, but who are enrolled in the correct scheme. This Card is for construction workers who have yet to achieve a Construction NVQ, but who are enrolled to do so. There is one Green CSCS Card only. This Card is awarded to workers with basic site skills only (like labourers). The Green Card represents Construction NVQ Level 1. There are two types of Blue CSCS Card: one for Skilled Workers and one for Craft Unit Levels. The CSCS Blue Skilled Worker Card is awarded to construction workers who have achieved a Construction NVQ Level 2 in their chosen trade. Holders of a Red CSCS Trainee or Red Experienced Worker Card will exchange their existing Cards for a Blue CSCS Card as soon as they receive their Construction NVQ Level 2. Gold CSCS Cards represent a Construction NVQ Level 3. There are two types again: this time a Gold Skilled Worker Card and a Gold Supervisor’s Card. The type of Gold CSCS Card you hold depends on your role. If you hold a Construction NVQ Level 3 in your trade but are not employed as a Supervisor, you’ll receive a CSCS Gold Skilled Worker Card. If you are a Supervisor, you will qualify for the Gold Supervisor’s Card. There is one Black CSCS Card available, for Managers. The Black Manager’s Card represents a Construction NVQ Level 4 or higher, depending on your role. There are three CSCS Card types representative of associated professions: The White/Yellow Professionally Qualified Person’s Card; the White/Grey Construction Related Occupation Card; and the Yellow Site Visitor’s Card. These CSCS Cards do not represent Construction NVQs. In order to get the right CSCS Card for your role, you will need two things: to have achieved the right Construction NVQ Level for your Card; and to have a CSCS Health, Safety & Environment Test pass. There are different types of CSCS Test for the different types of Card. Example: to achieve a Black CSCS Manager’s Card, you must pass the MAP (Managers and Professionals) CSCS Health, Safety & Environment Test. Construction Support Line provides experienced CSCS Card assistance for thousands of workers across the UK. Apply for your CSCS Card online or call our team free on 0800 012 4125 or 0203 051 1004 if you are on a mobile.